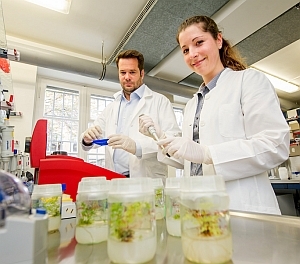 Botanists at University of Bonn, with researchers from 10 other German institutions, are devising a system of standard identifiers based on DNA sequencing to identify plant and animal species more efficiently. The German Barcode of Life (GBOL) project is coordinated by the Zoological Research Museum Alexander Koenig in Bonn. In the project, GBOL scientists are first creating a library of sample material for classifying the species. Working with experts at natural history museums, nature conservancy organizations, and elsewhere, specific plant samples throughout Germany will be cataloged. Quandt notes there are some 4,000 flowering plants in Germany, as well as 1,300 species of mosses and ferns. The project is expected to make monitoring environmental effects easier. The data are expected to help answer questions on potential extinction of species due to climate change, or replacement of home-grown species by imported organisms. The German Federal Ministry for Education and Research is providing €850,000 ($1.1 million) for the collection of plant DNA bar codes in Germany.